The obvious – to be able to add bigger tires and increase ground clearance. Better off roading articulation and performance. The other obvious – to climb and run trails you were never able to before! To look cool of course! Too be able to look down on other vehicles along the roadways.. Excuse to buy the new axles. To intimidate others both on and off the trails. No more need to jack your jeep up when cleaning undercarriage or making repairs. To be able to hit the deep bogs!!! To veer off the less than enthusiastic off roaders (Back seat drivers) from wanting to ride along with you.. They will be scared! To make the once impossible to possible! That is just some reasons to add a lift kit to your Jeep. Feel free to add your reasons. Do you think it is possible to come up with 100 reasons? A lift kit on a Jeep looks sweet – no doubt, but is it for everyone? Not necessarily. Here are a few things to consider if you are thinking of getting a lift kit to sweeten your ride or get the clearance your looking for in some serious off roading. First, think of the primary use of your Jeep. If your primary use of your Jeep is pavement, and you just to do a lift modification for looks, which is cool, don’t get me wrong, you will not need as aggressive of a lift as someone who primary use is off roading. If your primary use of your Jeep is off roading and you hit the trails hard with a variety of extremes, you best make sure you get a lift that can handle the pressure. That is where your research will come in. Before selecting a lift kit for your Jeep, hang out with others that have them already installed in their ride. Ride with them and get a feel for how a lift can change the feel of your ride. The more different people you talk to the better. Read reviews on various lift kits, and if you belong to a Jeep Off Roading Club, watch how well various lift kits work on the trails. No matter how great your buddy may say his Lift Kit is on his Jeep doesn’t necessarily mean it is the one for you. Take into consideration your budget. You can spend a few hundred dollars or a few thousand dollars on the kit alone, that is not including installation. If you have the capability of installing the kit on your own, great, but if not, you had best add labor into the cost of having a lift kit installed into your budget as well. Take into any other modifications that you may have to do or want to do when installing your lift. Will you need bigger tires? You may wind up needing control arms, adjustable track bars, longer brake lines, better steering components, new drive shaft, slip yoke eliminator, gears, axles, and the list can go on. If your Jeep is a work in progress and sitting idle until complete, this may not even be an issue, but if you are wanting to hit the trails or road right after you are done, consider all cost that may come about in your budget. Pro Comp is globally recognized as one of the leaders in off-road technology. Since 1992, Pro Comp has been manufacturing high quality, durable products for on and off road racers and enthusiasts. Pro Comp Lift Kits have always favored an approach centered on forward progression and self-improvement, and the results can be seen in the past success of Pro Comp Suspension Lift Kits. 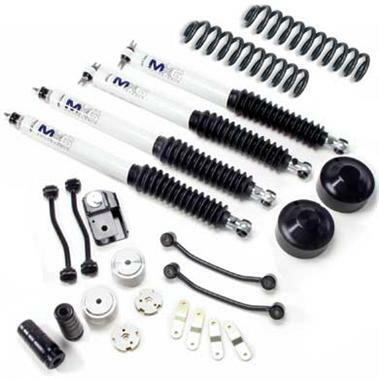 Sticking to the philosophy of constantly upgrading technological standards and managing value and ease of use for customer benefit, Pro Comp Suspension aims to maintain the extraordinary march to brilliance that has made Pro Comp Suspension Lift Kits industry frontrunners for many years. Pro Comp Suspension is proud to introduce an effective and affordable suspension system for the 2007 Jeep JK Wrangler 4WD 2 door models and 4WD / 2WD 4 door models. This front and rear suspension system installs quickly and easily. Specifically rated front springs are used to reduce body roll and brake dive. Rear coil spacers are used maintain factory ride characteristics, load capacity and proper lateral stance. A rear track bar bracket with an eccentric adjuster allows perfect centering of the rear axle. Billet aluminum rear bump stop extensions, extended sway bar links and brake line extensions complete the package. This sensible system will level the vehicle, allow the use of 35 tires and improve factory ride quality. Available with MX6 Adjustable shocks or E9000 series gas charged shocks.